Lots of my posts, especially at Christmas time are about food, but then again it is an important part of Norwegian Yuletide. This post is about some of our old home made food traditions, with recipes passed down for many generations and I consider myself lucky having a mom who still holds on to them. My mom and grandmother did most of it in the kitchen with fresh meat coming directly from the butcher. Then of course we have the cookies – 7 varieties – and the marzipan and other types of confect. It all shows up at our First Christmas Day smorgasbord at the traditional family gathering. Our constitution was signed at this day in 1814 and declared Norway an independent nation. 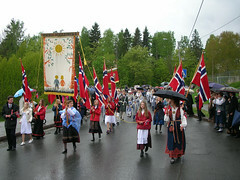 All over Norway, children march through the local neighbourhoods with an abundance of flags and traditional costumes. Each elementary school arranges its own parade, led by the school’s own marching band. The parade takes the children through the community, often making stops at homes for senior citizens, war memorials, etc. Norwegians have either a spruce or a pine tree in their living room – decorated with white lights, tinsel, Norwegian flags and other ornaments for Christmas. As a child and with my children of course, we made paper baskets of shiny, collared paper. The baskets can be filled with candy or nuts. Chains made of collared paper are also very popular. Our celebration starts Christmas Eve at 6PM with a feast and before presents are opened, we “circle the Christmas tree”; all the family holds hands to form a ring around the tree, and walk around the tree singing carols. After all, my blog is about our significant four seasons and this post literary illustrating my point. It’s a story about our favourite beach and how it change from the hot summer days where you need to cool down in a dip and then to wintertime where we go skiing and skating at the very same spot. So within 6 month, you switch from snowsuits to tiny bikinis – and everything between (sometimes less *LoL*). 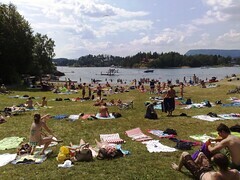 Around summer solstice, the sun is up from around 3:45AM to 10:45PM -19 hours in southern Norway. If you then have in mind that the sun is up only for 5 hours in mid winter and the temperature is around -10C, I guess you understand why Norwegians are crazy about taking advantage of this sunny, warm weather. After sharing about Norway in general and Oslo in particular, it was a blast of a gathering when I finally could meet at least some of my regular readers and show them around at places they had read about and wanted to see by themselves! The top of the cream was when The Major of Oslo invited as all to the Town Hall and even a guided tour around in the building. I’ve done my best to collect some of the blog posts by the participants about their stay and what they liked about Norway and Oslo. Take a look at OsloBG’s official program site and there you find the link to the participants and their reports from the gathering! As I always say “Blogging Connecting People”: When I started this blog and first came up with that motto I had no idea how true it would be. Now I have so many good friends from all around the world, and blogging here on my Terella has brought me in touch with all of them. Thank you all for following along on my adventures and here’s to another year of blogging and connecting people! I’m a creative, enthusiastic, self motivated man with extensive experience in networking. Happy Blogaversary!!! 6 years! Pretty impressive. My favorite post is of course the one on my mountain trip when I debut as a guest blogger ;-) Good times!! Congratulations and long life to Terella and of course, his owner! Hugs from me and Helena! HAPPY SIXTH, my dear…I just had mine, too….It is an amazing journey, isn’t it, Renny…..Meeting so very many WONDERFUL People….! The Joys Of Blogging!!!! Congratulations Renny! Glad to see you are doing so well. Love the tradition of joining hands and singin’ round the Christmas tree. Congrats guys. And very best of luck for your future blogs. Love your writings so much. Happy Blogaversary Renny ! 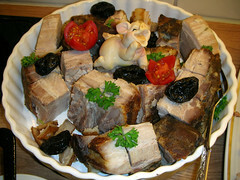 For me was fantastic to fine your blog about Norway ! An after we are friend ! Tusen Takk for all the information ! Happy blogoversary, please keep blogging, you’re always so interesting. Here is my gift, with many hugs! You have a lot to celebrate after 6 years with this blog, Renny. Congratulations! You opened a new world for us. And thanks to you we have met blog-friends in real from many contries and made contact with bloggers from all Continets where people live. And thanks to you we have met bloggers personally and made forever friendship, in Sweden, France, Victoria BC (Canada) and Minnesota, Indiana and California (USA) and not to forget all the bloggers we have met from abroad here in Oslo during your and Dianes OSLO BG event in August 2010. Simply said dear friend: You have changed my day and agenda, which will be very good for my soon to come retirement from April 2012.
btw. I’m thinking about your health. I hope you will have a medication that will benefit you and hence all your blogfriends around this small planet, who loves to read your great blog-posts. Hooray for six years!!! It doesn’t seem like that long ago. And I couldn’t agree more with Tor and Ginnie’s comments! Happy Anniversary, especially on 11-11-11. I wish your Blog all the success in the world and may we celebrate this special date for many years to come! !